Stock photo of the central building and bridge at Plaza de Espana, Parque Maria Luisa, during dusk in the City of Sevilla (Seville), Province of Sevilla, Andalusia (Andalucia), Spain, Europe. A bridge leads to the many archways of the central building of Plaza de Espana, city of Sevilla. 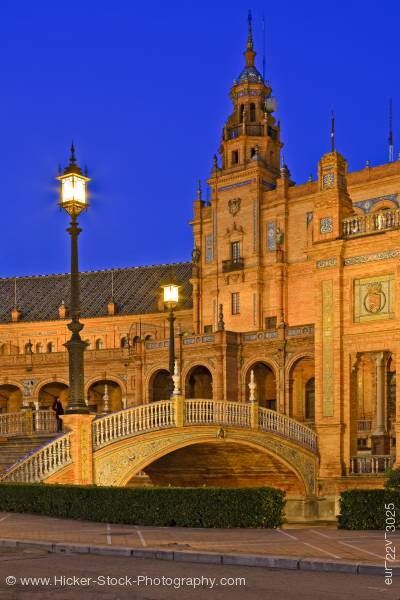 This stock photo shows the attractive central building and bridge at Plaza de Espana, Parque Maria Luisa, during dusk in the City of Sevilla, Province of Sevilla, Andalusia, Spain, Europe. The evening lights glow on the wonderful details of the Moorish Revival architecture of the central building at Plaza de Espana. The walking bridge spans the moat leading to the many detailed archways of the central building. Panels of beautifully colored tile sit among the stone of the structure. Lanterns stand on columns of the walking bridge. Well trimmed hedges run along the sidewalk leading to the bridge. A deep blue evening sky is a wonderful backdrop to the amazing architecture. Central building and bridge at Plaza de Espana, Parque Maria Luisa, during dusk in the City of Sevilla (Seville), Province of Sevilla, Andalusia (Andalucia), Spain, Europe.